For the ninth time in a row the magazine Sun & Wind Energy commissioned solrico to carry out what is the largest public survey of the international solar thermal industry. 250 flat plate, vacuum tube and air collector manufacturers are presented on the world maps. solrico has sent surveys in eleven different languages to 550 flat plate, vacuum tube, and air collector manufacturers from 68 different countries in September 2015. Of the companies contacted, 250 are listed on the four world maps that were published in the November issue of Sun & Wind Energy. 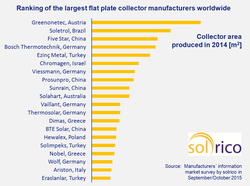 The flat plate collector industry in Europe is under pressure. Overcapacities and price drops have resulted in mergers and production stops, so that the world map this year lists 5 % fewer flat plate collector manufacturers. The vacuum tube collector industry is establishing itself in Turkey, India and Mexico, where the first vacuum tube manufacturer in Latin America is being built. The biggest fluctuations are in the field of air collectors, however.